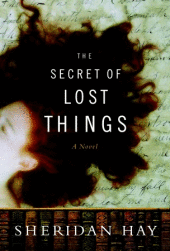 I saw this book, The Secret of Lost Things, when I was wandering through Barnes and Noble during Lent. Having given up shopping, I didn’t purchase it but waited until I found it at our local library. I read it this weekend, it’s a short book, and after I post on it, I can finally address the L’Engles that have been screaming my name since I posted them on my Once Upon A Time Challenge. I was attracted to this book initially because of the title. We have all lost things, from the most benign (such as keys) to the most harrowing (such as people we love), and I was terribly curious as to the secret from this author’s point of view. We are told the secret through the eyes of the heroine, Rosemary Savage, who lost her mother at the age of 18 in her country of Tasmania. She leaves for New York, with her mother’s ashes in a box, and comes to work at an absolutely charming, but weird, bookstore. It reminded me of The Shadow of The Wind because of the unusual characters, and the theme of a search. The story revolves around a lost manuscript by Herman Melville, titled The Isle of The Cross. Near the end of the story Rosemary muses, “Reading Melville should have taught me as much: we all pursue a phantom.” I laid the book down at that point to consider each character and what they were pursing, then thought about my life. Am I pursuing a phantom? Are we pursuing some kind of phantom? I think so. I think there’s always something just beyond our grasp of understanding. Or reach. This book sounds great, and I really enjoyed reading your thoughts on it 🙂 The cover drew me in as soon as I saw it on your blog. I may have to pick this one up. I saw this one at Borders this past weekend and almost picked it up!! I'm impressed you gave up shopping for Lent!! That is quite a challenge! Chris, the cover was quite alluring; something about it draws us to it. As well as the title, I think.Stephanie, if you or Chris pick it up, let me know what you think of her 'secret'. WARNING! SPOILER to FOLLOW! Here's how I responded to the question, "Fine, Bellezza, what the heck IS the secret anyway?! ":Ah, I'm glad you asked. The secret, as far as I understand it to be, is that losing something/someone gives us freedom. Here's a quote from near the end of the book when Rosemary celebrates Christmas alone: no husband, no father, no mother, and her friend returning to Argentina to bury her own son: "For the rest of my life I would miss my mother, but I somehow knew that night, that first Christmas without her, that I'd have to learn to accomodate the great favor her death had brought me. It was a gift that brought with it obligations to live as best I could, and to remember. But the realization that her death had given me freedom, that this is what the dead bequeath the living, stunned me." page 302. The author ties this concept of freedom in with NO REMORSE as well, and I think that is the more significant part. If we can lose something, without feeling guilty about it, than we are free. Thought provoking, isn't it? I'm definitely drawn to this one. Am adding it to my list. Sounds very interesting!Ordered myself a copy of Wrinkle in Time last night! quixotic, I began reading Wrinkle yesterday during our class silent reading time. It brings back such happy memories of when I first read it. There's nothing like opening a treasure box again and again. Few books are like that for me, but Wrinkle definitely qualifies! This time, I'm looking forward to reading the whole quartet. Will you stop after Wrinkle, or keep going? Lady G, yeah, but at least your tax dollars are working for you! Our town, of 300,000 plus has over four library branches of the main library, and when I'm upset about how dreadfully the librarians are (and have been since the 1960s) I'm grateful that they do have a plethora of selections for us readers. I'm interested why you said this book is a God-incidence? I'll be over to see you when I get home from school today and have some time. Definitely a thought provoking ending. It reminds me of the way I feel in the wake of tragedy…kind of that stunned realization that I need to take the time to really and truly LIVE, not just wander through life at life's pace.Love the cover of the book and the title. Both are very eye-catching and I can see how it would be something that would attract a shopper to pick it up. It's always fascinating to me, Carl, to find an author's take on loss. I seem to search for it in the books I read because loss is so relevant to living. Not to be macabre, or anything. Just realistic. Bellezza – I'm not sure yet. If I like Wrinkle in Time I may keep going. 🙂 Well, probably not one after the other, as I have lots of books to get through already! I'm skipping your spoiler because this one really appeals to me (and everyone else, I see). Thanks for a lovely review. quixotic, the most important thing now (at least to me) is to get a few under my belt for the Once Upon A Time Challenge. Fortunately, Wrinkle is not only beloved, it's short.Bookfool, I hope I caught your interest. This was only around 300 pages, so it didn't take too long to finish. It's one of those books I keep thinking about, though. I'm glad you published the comment for the secret as it was thought provoking to read your review and the comment – didn't spoil it for me.However, the fact that you gave up shopping is the most interesting fact here. Did the loss teach you a secret? If so, share.P.S. comments seem to work fine from my mac…. I will definitely read this book this summer. Thanks for the review. Mother Pie, hooray, you're back! I missed you. You are the only one to pick up on the "no shopping for Lent" phrase, which I wrote about on my post Sometimes Empty Is Good (http://dolcebellezza.blogspot.com/2007/04/sometimes-empty-is-good_08.html). It might be easier to click on the link under April. I'd be very interested in what you think if you go there to read my thoughts…I always try to give up something that will be a challenge for me, to remind myself of sacrifices made for me/us. Some years are more successful than others. The year I tried to give up chocolate? Failed miserably. Ms. Teacher, thanks for coming by. It's a quick read; I hope you like it. Whew! I scrolled fast enough to miss the spoiler! Thanks for giving me another book for my mountain. Marina, I'm glad you escaped the spoiler! That's one thing I'd never want to do: ruin the surprise for someone planning to read the novel. Thanks for stopping by.